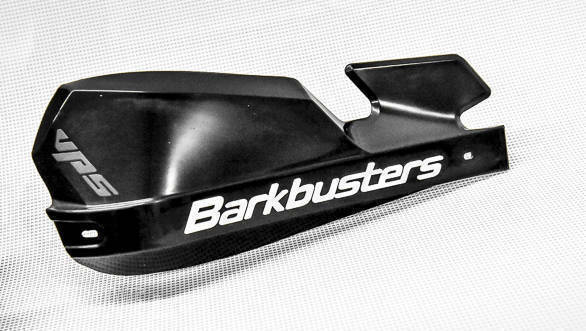 Barkbusters is a pretty well known Australian company that's been around for ages and their iconic products date back to 1984. A Barkbuster is a simple, strong aluminium guard that goes around the levers, grips and riders hands and offers them protection. In the case of the Ducati, the presence of the LED indicators complicates matters and so you get the BLGs, or Barkbusters Lever Guards. 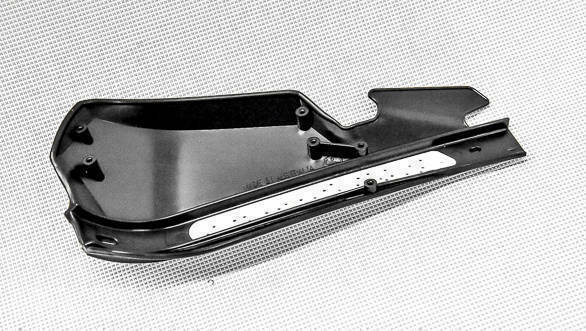 In the package is a shaped rectagular section aluminium bar that is meant to sit outside the Ducati's OEM handguards - a plastic unit with integrated LED indicators. 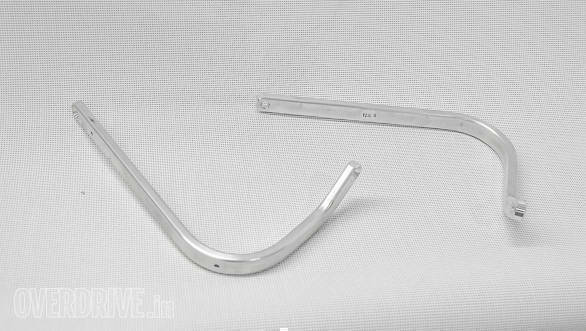 At one end is a bolt that goes into the end of the handlebar. At the other end is a simple clamp with some angular adjustability that you clamp on to the handlebar ensuring no wires are pinched or kinked in the process. 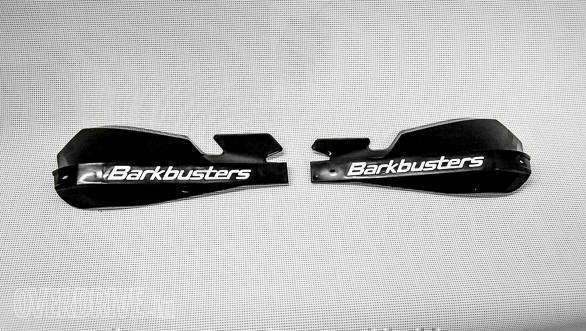 Barkbusters makes bike-specific kits and on models that do not have indicators which might get obscured, you can choose from a range of designs and colours of plastic shields that mount to the bar to add more protection as well as take off wind - useful in the cold. The kit is complete and the instructions are dead simple. Mounting the BLGs to the Ducati took a moment and a half and after that, the Barkbusters BLGs just disappeared into the motorcycle. I happen to like the fact that they're nearly invisible. On a day to day basis, they already pull their weight. Mumbai sometimes requires you to squeeze past trucks parked badly and illegally on the left edge of the road - I'm looking at you Bisleri Factory. Getting through traffic here with a bike this size means you get pretty close. I've a couple of nicks on the gloss black finish to show for it. But when I crashed the Ducati in April - before the BLGs - I realised that the Multistrada 1200 S doesn't crash well. 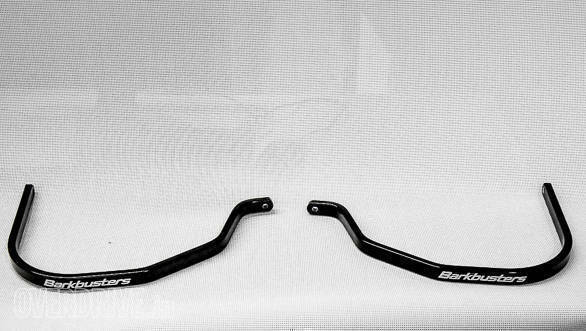 Nothing really broke but the twisting of the OE handguard caused scuff damage to the levers, mirror stalk as well as the left handguard itself. Then Bert fell off the bike in August, same side. This time, there were two bad scrapes on the BLG to show for it, no other damage resulted. Score! I got them repainted to matte black to match the handguard for free when Feroci was being repaired and the handlebar, BLG et al remain undamaged. Rs 8,100 might be a little too expensive on a motorcycle like the Royal Enfield Himalayan but that aside, the Barkbuster is a well-made, well finished, simple and effective product. You can use the coloured plastic shields to create a dramatic look if you like, or have just the bar 'disappear' into the motorcycle as it were. The protection is good to have and in our case, the Ducati carried on the Ladakh run because no levers needed to be replaced, they weren't even scuffed. Highly recommended, if the price is right for you.